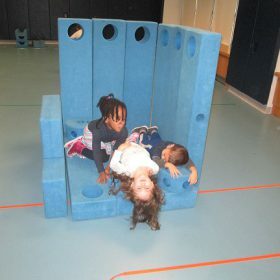 Big Blocks is provided as an enrichment class for the Pre-K, Kindergarten, and First grade classes at the Peck Slip School. Goals in math, science and most particularly, Social/Emotional growth are integrated holistically in every class across the entire school year. Respect for the input of your team mates. 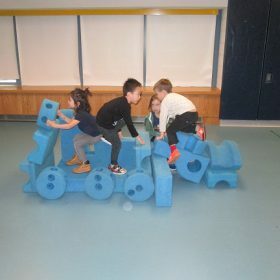 The work children do in a Big Blocks class provides children with math and science experiences similar to those learned and practiced when working with smaller scaled unit blocks. The importance of language and language development cannot be underestimated as children work with big blocks. Children use the language of mathematics while communicating with their classmates in planning and building structures. Children engage in the language of problem solving when resolving conflict with their peers. There is also a Social Studies component as children will often build structures related to classroom studies. 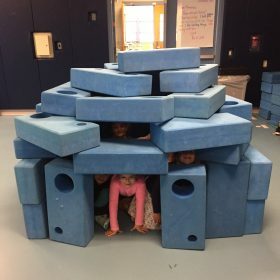 But mostly, children use the language of imagination and fantasy, as Big Blocks class provides a forum where children can allow their imaginings to come to life through “life sized” structures.